Ruth Butterfield-Winter: Bio & Choral Music | Santa Barbara Music Publishing, Inc.
Ruth Butterfield-Winter, pianist/composer/arranger, is a native of California. She studied piano with Adolf Baller and John Delevoryas in the San Francisco Bay Area before attending the Curtis Institute of Music in Philadelphia, PA, where she studied accompanying and chamber music with Dr. Vladimir Sokoloff. While she was at Curtis, Ruth was often asked to performed new works of the composing students, who studied with Ned Rorem and Jacob Druckman. 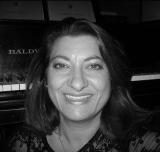 Ruth is known throughout the San Francisco Bay Area as a sought after chamber musician, accompanist and teacher. She has ongoing musical projects with members of the San Francisco Symphony and was recently the guest artist with the San Francisco Bay Area Winds. Ruth has served as orchestral pianist in the San Francisco Chamber Orchestra, Monterey Chamber Orchestra and Santa Cruz Symphony. Before returning to California in 1994, Ms. Winter lived in New York City, where she was on the accompanying staff at The Juilliard School of Music and played with the New York Chamber Ensemble. Ms. Winter is a singing member of "The Choral Project" of San Jose, CA, Directed by Daniel Hughes, (a semi-professional choir) where she also serves as accompanist. She has been serving as staff pianist at Advent Lutheran Church, in Morgan Hill, CA since 1999. Ruth Butterfield-Winter has 1 titles published with Santa Barbara.